This Snyper Two Yellow was reviewed on 10 different criteria. The review is for this specific watch, other models may perform differently. Evaluation is based on my wrist size, personal opinions, experiences, and preferences. A brand and watch that is inspired by a sniper and its sniper rifle... now that is something different. Definitely a unique concept and not something you will find in another watch brand. This is a brand with a very defined identity and its perfect for all those gun lovers that need other items in their life to be related to their passion for guns. The good news? The design elements taken from the sniper rifle as its inspiration are subtle and on point. The bad news? The watch is unnecessarily large and heavy. Overall, I think that Snyper did a commendable job creating a watch that is true to the brand's identity while keeping it attractive. A watch inspired by the sniper rifle. The black and yellow color combination with the addition of carbon fiber on any watch is usually a winning combination, and this one is no exception. There is a bright yellow angled flange with the minute markers that gives the watch that initial pop. 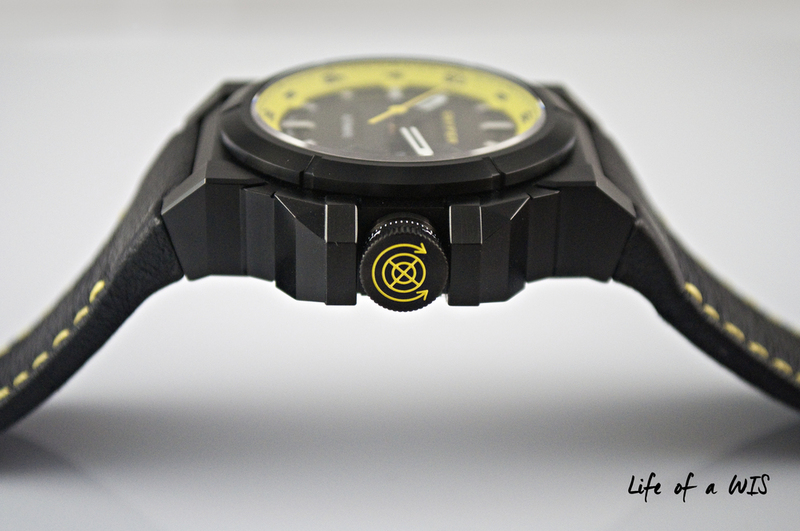 The printed "Snyper" on the dial and sweeping seconds hand are also colored with the same bright yellow, which works perfectly with the black and yellow theme. At the center of the dial, there is an area that has carbon fiber. The 3-date display window is a design preference that many purists hate, but I find it adequate for this watch. The font used for the day and date displays is quite modern, which goes well with the overall theme of the watch. Unfortunately, the white used on these displays is a shade too light in my opinion… The applied hour indices have lume in the middle and it adds luxury to the watch. However, the hour index at 12 o’clock is slightly crooked, which would drive me crazy if this was my watch. These kinds of quality control mishaps are a great pet peeve of mine. The lumed skeleton hour and minute hands are basic, especially if you consider all the other components surrounding them. Black and yellow, a winning color combo. 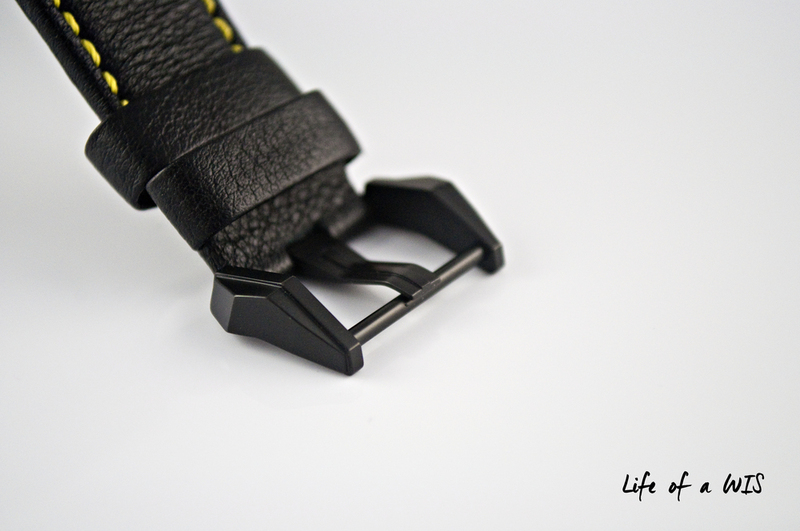 The integrated strap is made of black leather with yellow contrasting stitching and it comes with a PVD tang buckle with push pins. The quality strap is very soft and the length is perfect, my 6.5” wrist uses the fourth hole from the top (total of 7 holes). 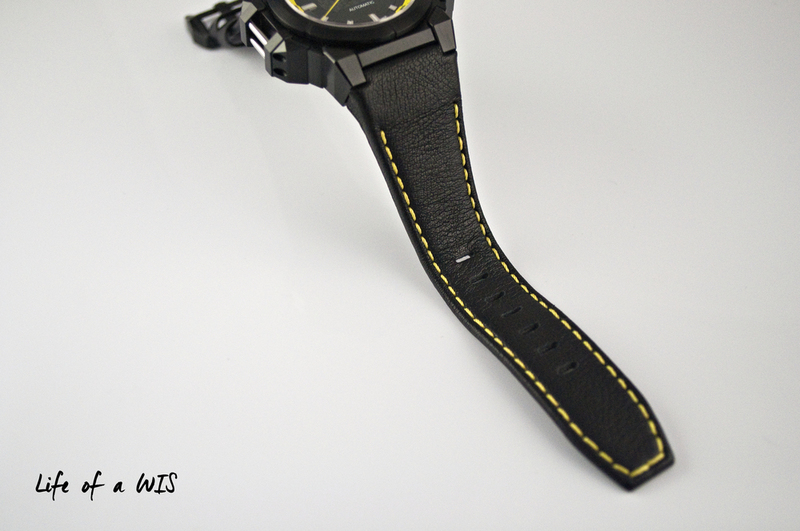 Like all integrated straps, this strap has a natural curvature that follows the shape of your wrist. The design of the tang buckle is unusual. At first sight, it appears as if the tang buckle was installed backwards because the area where the tongue of the buckle sits is just a normal tube, which looks like the push pin that would normally be on the opposite side. I have never seen a buckle designed this way so I give Snyper props for originality. My only complaint about this strap is that the free keeper is too loose… and I hate it when that happens because the keeper tends to move around during normal wear. An unusual but original tang buckle design. This self-winding mechanical watch is powered by the Snyper Calibre F100. This movement has 24 jewels, a power reserve of 48 hours, and a frequency of 28,800 vibrations/hour. Time keeping was spot on during the duration of the review. The case back is affixed to the case via 6 screws. The Snyper Two is easy to read during the day or night. The polished applied indices with lume in the middle and the three-quarter lumed minute and hour skeleton hands contrast nicely against the black dial. Since there is lume on all the hour indices and on the minute and hour hands, telling time in the dark is a nonissue. The dial is easy to read, day or night. 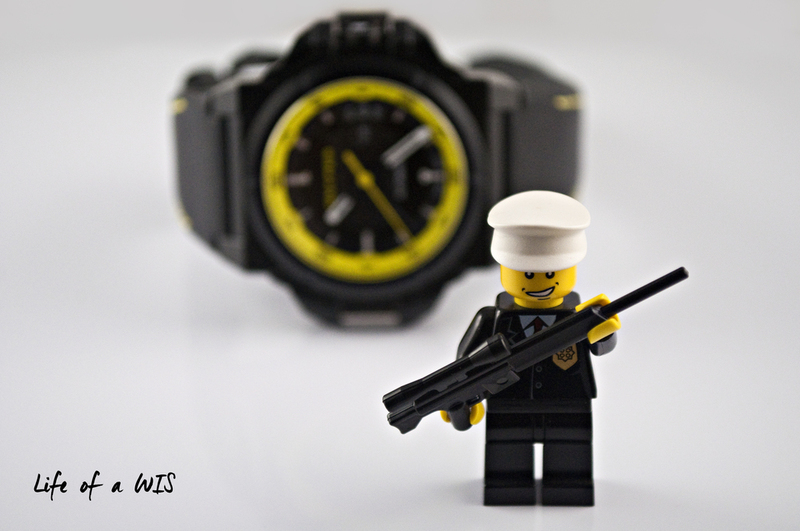 All functions of the watch were working properly during the review. Despite having gigantic crown guards, the oversized crown is easy to manipulate and use thanks to the ridges on the top. The crown is designed after the adjustment knob typically found on sniper rifles. The Snyper Two features a massive 50mm stainless steel case with PVD treatment, 100 meters of water resistance, a screw-down crown, day-date complication, and two fixation bars at the 9 o’clock side of the case (exclusive to Snyper). Too bad this mini sniper rifle will not fit on the fixation bars. Despite its colossal size and heavyweight division, the Snyper Two remains considerably comfortable on the wrist. The soft strap with the right curvature, tang buckle, and my flat wrist all worked together for the overall acceptable comfort. However, there is no denying that the watch is simply too top heavy which was annoying from time to time. The strap is soft and comfortable, but the watch is simply too heavy. 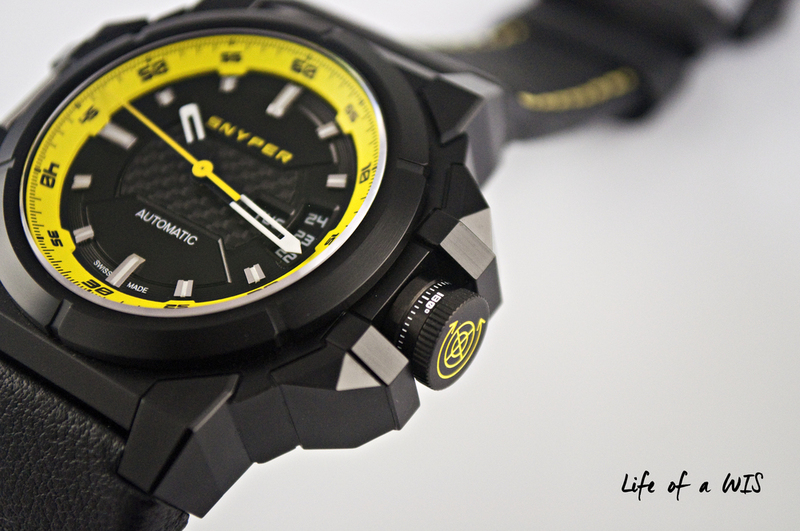 The retail price on this limited edition Snyper Two Yellow is $4,600. Not too bad for a good looking limited edition model, but maybe a bit aggressive for a less known brand. At around $5K, there are plenty of interesting choices out there... but if you are looking to stand out in the crowd and want to be different without breaking the bank, this Snyper Two Yellow might just be the right watch for you. A watch with a solid design that is in desperate need of a diet.